The actual game "Pimpwars" has its start in 1990, and the author was Paul J. Martino. Paul supported the game for a good many years (until the late 1990's) at which point it has been taken over by other folks, who continue the development. Current development of Pimpwars is being done by James Coyle of Mystic BBS fame, who is maintining DOS, Windows and Linux versions of the door. The version called "Pimpwars 32" is a version of Pimpwars to work with Windows; it is not a new game. 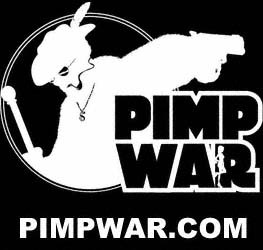 There is a web version of Pimpwars at PIMPWAR.COM which runs online multi-player games, sells pimpwar merchandise, and offers IRC chat channels to discuss the game.